HANNIBAL, NY – The Hannibal High School auditorium was silent as the credits rolled after a screening of the documentary film Bully recently. 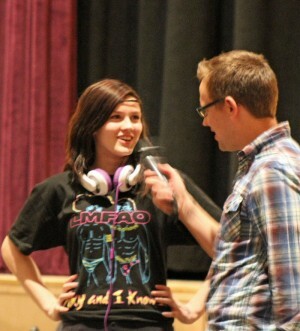 The powerful film presented the stories of five middle or high school students coping with the effects of bullying. One student is unable to get help from his school’s administration, another is dealing with coming-out as well as bullying, the next is living in a juvenile detention center as a result of standing up to her bullies, and the final two students are represented through photos as video as they both took their own lives as a result of the abuse by bullies. Bullying has become ingrained in our culture and students, parents, teachers, and school districts all over the USA are standing up against bullies. Arlene Laut and Nikki Erkan, co-advisors of the Hannibal Anti-Bully Group, are two educators taking a stand. Both teach at Hannibal High School and started the group after receiving many requests from students. The group meets after school and they’ve been planning the recent event since the first day of school. The event started while school was still in session. 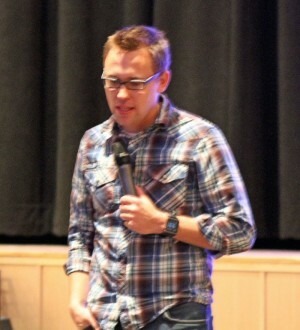 Students in grades 9-12 all viewed the movie and participated in a discussion with motivational speaker Brooks Gibbs. The goal of showing the movie to the students was to create a sense of empathy in the student body and show students what it’s like to be bullied. “The kids took it very seriously,” said Laut. After the screening, Gibbs took the mic and talked with students about the flaw of the film. Bully makes the victims seem powerless and as if they have no voice or tools to stand up to their aggressors. Gibbs’ message is to “victim-proof” children by teaching them ways to interact with difficult people. She and her friends were encouraged by Gibbs’ message, saying that his ideas were something they could apply to their own lives. Gibbs noted that nowadays bullying is more verbal. It’s based on hateful words (either spoken or posted online) that break down the character and mental strength of the victim. He wants all students to learn to shrug off negative criticism, take responsibility for their own thoughts and feelings, and abide by the Golden Rule – treat others as you want to be treated. “I was interested in hearing what the presenter had to say,” one mother said. And when it came to Gibbs’ message regarding hateful words. “I liked it a lot. I liked the perspective that you have the power in you to make that count or not,” she said. Gibbs hopes to return to Hannibal to speak to the middle school students as well.